Tankered waste is waterborne waste from domestic, industrial or commercial generators delivered to discharge locations within our sewerage network by approved waste transporters. We impose strict rules on the transportation and discharge of Tankered Waste to ensure it does not pose a risk to our sewerage system. We will not accept waste generated outside our service territory (Brisbane, Ipswich, Lockyer Valley, Somerset and Scenic Rim). Waste transporters must be approved by us before we will accept waste from them at our discharge locations. We will only accept waste that is of a type and volume known to be compatible with our sewerage system. a Queensland Urban Utilities Waste Transport Docket for every load. a Queensland Government Waste Transport Certificate for all loads of regulated trackable waste. For more information, refer to the Tankered Waste Management Plan. There are two categories of tankered waste, Deemed Quality and Special Disposal. All tankered waste must meet the requirements of one of these categories. All It is the responsibility of the waste transporter to properly assess waste quality characteristics before delivery to the discharge location. If the waste is not Deemed Quality Waste, the waste transporter must ensure the waste generator obtains a Special Disposal Approval for the intended discharge. When seeking to discharge special disposal Tankered Waste, the waste generator must contact us (3432 2160, 8:30am – 4:30pm weekdays) and request to speak with a Trade Waste Officer. If the waste is acceptable for discharge, a Special Disposal Approval will be issued with specific discharge conditions. Sullage waste – clarified waterborne waste pumped from septic tanks or small residential onsite treatment plants. Holding tank waste – waterborne waste pumped from holding tanks accumulating kitchen and domestic waste from non-sewered premises. Septic waste – waterborne waste pumped from septic tanks or onsite treatment systems. Grey water – wastewater generated from domestic activities such as laundry, dishwashing and bathing. Portable toilet waste – waste collected from portable toilets. 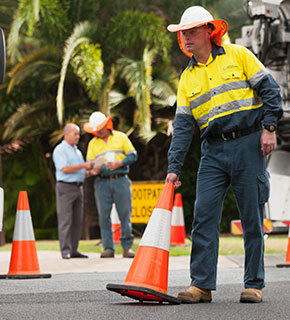 Transporters who hold a Tankered Waste Approval, are authorised to discharge Deemed Quality Waste at Queensland Urban Utilities discharge locations without further notice or approval, subject to opening hours. Wastes that are not Deemed Quality Wastes (i.e. are not sullage, holding tank waste, septic waste, grey water, black water or portable toilet waste) which have been assessed by Queensland Urban Utilities and have a Special Disposal Approval. Transporters who hold a Tankered Waste Approval, are authorised to discharge approved Special Disposal Waste at the nominated Queensland Urban Utilities discharge location subject to the conditions of the approval. Waste generators and transporters should refer to their responsibilities under the Environmental Protection Regulation 2008.